All Are Precious In His Sight: Bye Buzz, We Love You! Bye Buzz, We Love You! 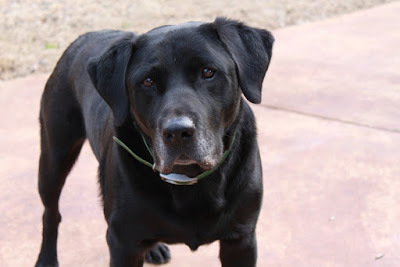 It is with great sadness that we inform you that our black Lab of 12 years, Buzz, passed away the afternoon of March 1, due to antifreeze poisoning. Our oldest son, Parker, has raised Buzz from the time that Parker was just two years old. Buzz was an amazing dog who everyone loved. He was laid back, obedient, gentle, trustworthy, and loyal. A great dog and faithful friend who we will all miss. We do not yet know the source of the poisoning, but our neighbor/friend lost two dogs to the same thing at the same time as Buzz, and a third dog is in the vet hospital with antifreeze poisoning as well. (Now Sawyer's dog, Blue Bell, is also exhibiting signs of illness tonight, so we're praying he makes it and that none of the rest of our animals get into the poison, wherever it might be.) We know that our ranch and our neighbor's property does not have any antifreeze on it. We hope this is not a malicious act, and we hope to find the source of this so that we can properly dispose of the antifreeze and protect the rest of our animals, as well as all those in our area. We are so very grateful that our friends and neighbors, Artie and Moana Hughes, buried Buzz for us on our ranch by Chrissie's favorite "Lake Palic". It was just too much for us to handle. Too much loss. Anger. Frustration. Confusion. Sadness. We're ready for Spring. New life. And hopefully no more death for a while. We are grateful for friends who love us and are willing to do hard things to help others. Please keep the Hughes in your prayers as well because they lost two of their Boston Terriers to the poisoning, and their third Boston Terrier is fighting for life at the vet hospital. Oh how I wish Jesus would just come NOW and rescue us all. Please come quickly, Lord Jesus. We're ready. Selah Is Happily Awaiting Surgery! Selah's Having Surgery Wednesday at 11AM! Thank you for praying for me! Selah continues to do well! Selah is on her way home now!